Things have been a bit quiet around here lately. I spent the first week of this month in Chicago, enjoying the urban life. It was great trip. Pam and I staying at the Congress Plaza Hotel, right on Michigan Avenue. Highlights included visits to the Art Institute, the Museum of Contemporary Photography, the Museum of Contemporary Art, the Field Museum, and, of course, The Dark Knight at the Imax. Since vacations are supposed to be an opportunity to get away from old habits, I decided to bring a film camera. I finally used up the last of my Ilford XP2 Super – which was considerably out of date. I also shot over a dozen rolls of Fuji Neopan 400 and Adox CHM 400 film. The Adox film is re-badged Ilford HP 5+, and used to be sold through J and C Photo. The expiration date on the box was 7/2008 – so shooting it in the first week of August, 2008, was right on time. Remarkably, aside from the XP2 Super and a couple of rolls of Plus-X, all the film I shot on this trip was fresh. I guess I’m still using up 35mm ISO 400 B&W film. I shot 15 rolls of film during the trip, and have been slowly working my way through developing them. The film workflow is certainly a lot slower than the digital workflow, especially when you are developing it yourself. For development, I mixed up one of my last bags of Micrdol-X, which I’ve been using at the 1:3 dilution. The development time for the Adox CHM 400 is easy to remember – 22 minutes at 22C. 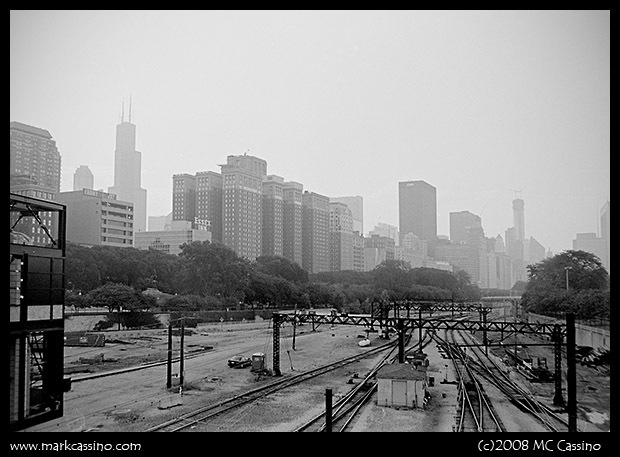 For the Fuji Neopan, I’ve been working with the 15.5 minutes at 22C. So far, 12 of the 15 rolls shot have been developed, but only a handful of those have been scanned. Did I mention that the film workflow is pretty slow? At home, other projects have been keeping me away from blogging. First and foremost, I’m trying hard to re-do this entire website. Really – it’s time for a new look and a structure that makes a little sense. So, I’m trying to hold off on adding to the current site while the new one is in process – so no new images in the Image Stream at this point. 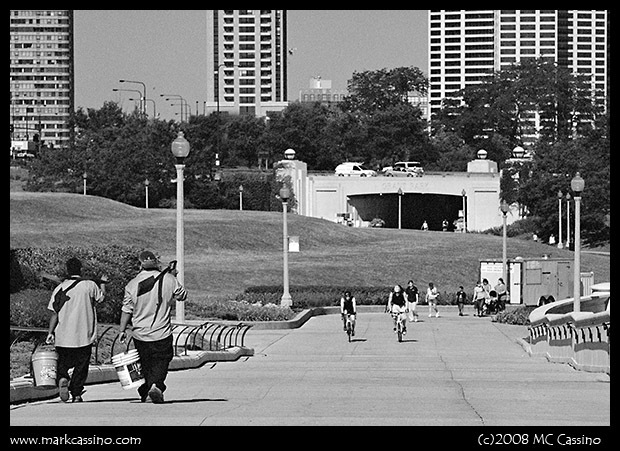 This entry was posted by mcc and is filed under Street Photography, Film Processing, Chicago. Good stuff, Mark. It’s nice to see a few of us still shooting the good stuff. The processing I enjoy. It’s the scanning stage that’s abhorrent. I agree with you on that last point - especially scanning 120 film on a flatbed. As for the good stuff - I just put one of my last rolls of HIE into the LX. It doesn’t get better than that!